During the 1960s, there was a small explosion of literature adaptation in the horror genre, the highlight of which was Roger Corman's Poe Cycle, a series of films based on the work of American Gothic author, Edgar Allan Poe. 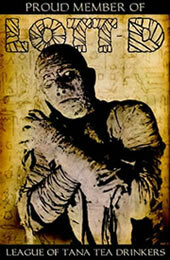 Once the success of these films became apparent, more film adaptations of other 19th Century authors began to appear. However, while some of these productions remain pillars of classic horror cinema, many of the films that emerged from this era was nothing more than campy, obviously low-budget productions made simply to cash in on a popular trend. Twice Told Tales, directed by Sidney Salkow is one such example. However, despite being poorly written and directed, Twice Told Tales is a strangely lovable film, much like a retarded puppy that you just can't bring yourself to chase from the yard. Adapted from the writings of Nathaniel Hawthorne, Twice Told Tales gives us three short films for the price of one. The first story, “Dr. Heidegger's Experiment”, is the tale of two old men who find a “fountain of youth” dripping from the ceiling of a crypt. Discovering that the strange liquid not only has the power to restore vitality, but life as well, these two men find that some things are better left dead. “Dr. Heidegger's Experiment” is followed by “Rappaccini's Daughter”, the story of a man who is so afraid of losing his daughter he changes the chemistry of blood to poison, preventing her from ever leaving his side. The final chapter of this trio of terror is “The House of the Seven Gables”. Gerald Pyncheon has returned home, despite a long-standing family curse, to find the vault hidden in his estate. Unfortunately for Pyncheon, the curse has other plans. The stories of Twice Told Tales are nothing spectacular or special. While the film is toted as being based on the works of Nathaniel Hawthorne, adaptation in this instance is being used very liberally, especially in light of the fact that “The House of the Seven Gables” is actually based on a full novel crammed into a measly 35 minutes. The stories are campy at best, and outright ridiculous at worst, following all the usual tropes and themes of thinly veiled morality tales. Both “Dr. Heidegger's Experiment” and “Rappaccini's Daughter” are typical stories of betrayal, coupled with a heavy dose of the fear of aging and being alone. Unfortunately, rather than using subtlety to relay themes, the time constraints require both of these stories to be very blunt. In both segments, there are even scenes where the characters explicitly state the nature of the story’s mystique (an illicit affair in “Dr. Heidegger's Experiment” and a father's entrapment of his daughter in “Rappacinni's Daughter”), stealing any modicum of suspense or mystery the stories might have possessed. The worst of the three segments, however, is “The House of Seven Gables”, which distills the most horror-rich supernatural elements of a complex novel into a painfully short space. The problem, of course, is that the intricacies of familial relationships are what made Hawthorne's novel. Now stripped of them, Twice Told Tales can only offer a clichéd haunted house story, that really has nothing unique to the bring to the screen. The ghost is that of a wrongfully murdered man who is out to seek revenge, the man he's seeking revenge against is rather unlikable, and the main love interests have strange, ethereal connections to events of the past. It's an old, tired story that isn't even told well, let alone in a new or exciting manner. Saddled with these familiar tropes, “The House of the Seven Gables” offers no surprises, proving to be a rather anticlimactic ending to an otherwise unimpressive story line-up. I wish I could say that, despite the lack-luster stories, the film is buoyed by brilliant direction and innovated cinematography. Unfortunately, the only word that comes to mind when considering these aspects of the film is “mediocre.” Director Sidney Salkow takes no risks with Twice Told Tales. From segment to segment, the direction never changes. Shot almost entirely in stationary medium shots, the variety of Salkow's repertoire only extends to the occasional close-up, usually to emphasize the special effects. This meager repertoire of technique isn't even used creatively, leaving the viewer with the feeling that Salkow is following a prescribed formula from which he is afraid to deviate, leaving the film feeling flat and stifled. The only thing that saves this film from the depths of obscurity is the brilliant performance (or, rather, performances) by Vincent Price. Price features prominently in all three segments, as Dr. Heidegger's best friend in “Dr. Heidegger's Experiment”, Rappaccini himself in “Rappaccini's Daughter,” and Gerald Pyncheon in “The House of the Seven Gables”. While Price may play the lead in only one of the three, being otherwise relegated to key supporting roles, he still manages to carry the show every time. Doing what he does best, Price plays sinister yet tragic characters with complexity and grace. In “Dr. Heidegger's Experiment”, Price not only manages to make us loathe his character for his lies and betrayals, but, at the end, manages to evoke sympathy as well. This mastery is again repeated in “Rappaccini's Daughter” and, to a lesser extent, in the “House of the Seven Gables.” Given the variety of emotional response that Price elicits in each of his performances, it is very clear that we are but puppets and it is Price who is pulling the strings. Despite its myriad of flaws, Twice Told Tales is a fun little flick. 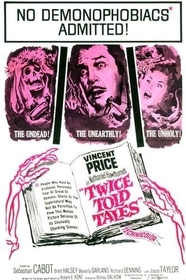 It's not brilliant, it's not unique and, aside from Vincent Price, its not even very good, but in the end, that doesn't really matter. It mimics the greater works of this period with an inexplicable ill grace that is somewhat endearing. A terrible film, with little to redeem it, I still adore it, even if I don't know why.